We’ve taken some fabulous trips, for which we are truly grateful. Most recently, we spent the weekend in New York City with Bjorn’s brother Brett. The primary reason for our January weekend get-away was to see the band Self play a show celebrating the 20 year anniversary of the release of the album Subliminal Plastic Motives. 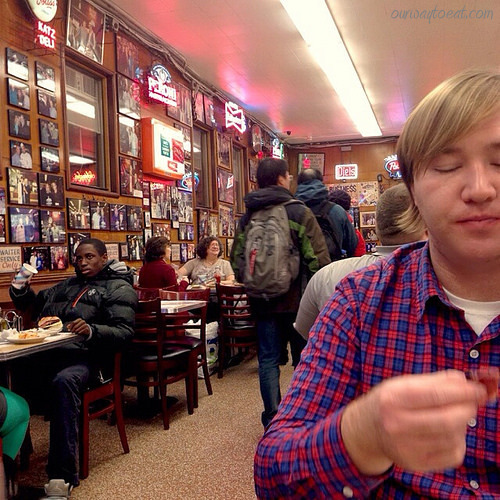 Before the show, at my urging we stopped at Katz’s Delicatessen to eat. 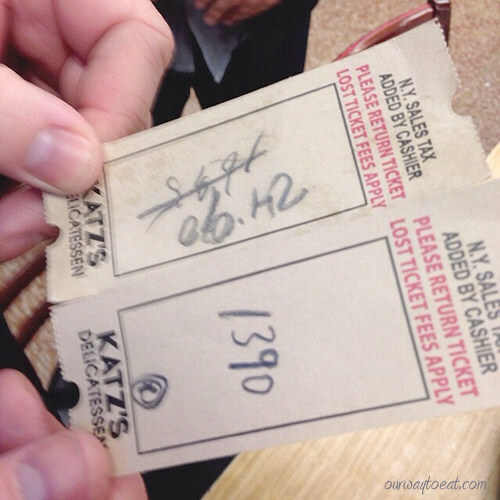 Katz’s Delicatessen opened its doors in 1888. When you look around the place, you get the sense of its history. Layers and layers of history are visible in all directions. When something new was added, the old is not necessarily taken away. There is a sense of the place’s age and at the same time, its vitality. This is Americana: a collection of artifacts, related to the history, geography, folklore and cultural heritage and flavors of the United States. 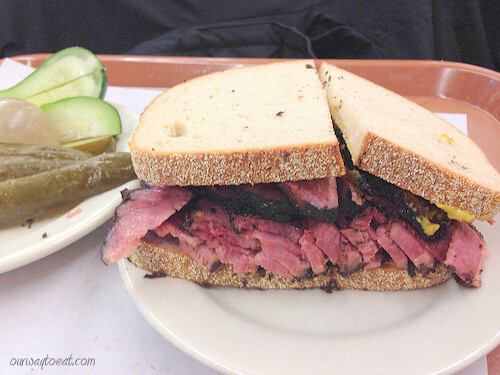 The “must eat” item on the menu at Katz’s is the Pastrami Sandwich on Rye, with mustard and pickles. My husband and brother-in-law were gracious enough to order one, since I’m not into pastrami. This is a gorgeous sandwich. Pastrami is piled high on perfect slices of rye bread, and finished simply with a schmear of brown mustard. If you say “yes” it will come a side mixed side of pickles–full sour, half sour and tomato. The piquant mixed pickles cut right through the heaviness of the meaty sandwich. 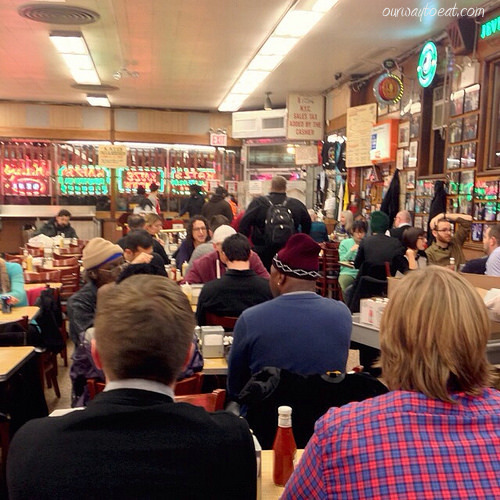 Katz’s feeds its share of tourists, but also people who appear to be at home there. It is the iconic deli in the movie When Harry Met Sally. 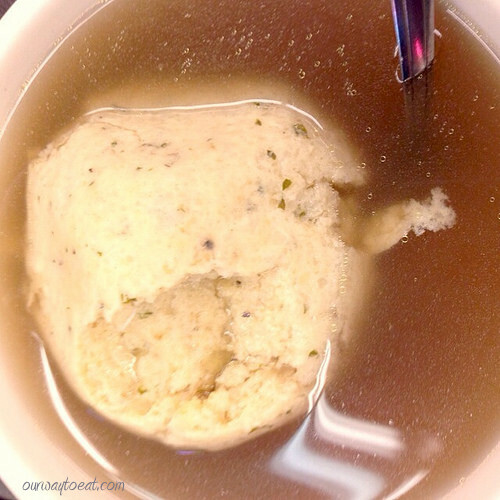 I tried the Matzo Ball Soup. As promised by my in-advance online reading, that giant Matzo Ball is actually as light as air. A confession: I know this is not vegetarian. That broth glistens with schmaltz. I make no apologies and have no regrets about tasting it. 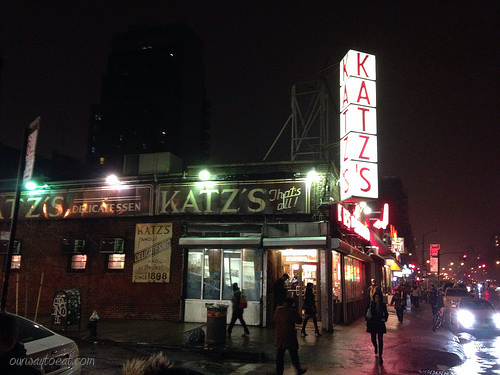 One of Katz’s slogans is “send a salami to your boy in the army.” This institution has endured more than one World War. It made me think about the generations of people who have worked and eaten here who endured wars, and generations of change, abundance and loss. I took a trip to the ladies room so that I could look around. Hey! 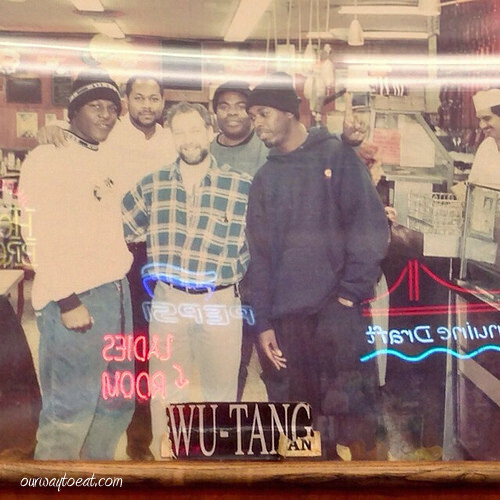 Wu Tang Clan has dined at Katz’s. Many other celebrities and dignitaries photographs line the walls, but Wu Tang was the one I photographed, probably due to the fact that I was at Katz’s with my husband and brother-in-law. 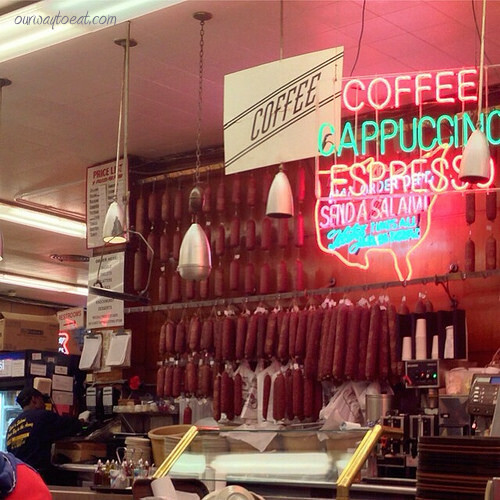 Katz’s Delicatessen is an interesting place. On a Friday night, it is full of people. When you walk through the door of the deli, you are handed a ticket. You might not notice it, if it is your first time, but do not lose that ticket! As you pick up items from the various stations at the deli counter, the person who serves you marks each selection on your ticket. You present the ticket to the cashier on your way out the door, they add tax and you pay. If you lose your ticket, you will pay a service charge, you will also leave with a bad taste in your mouth, I would guess. 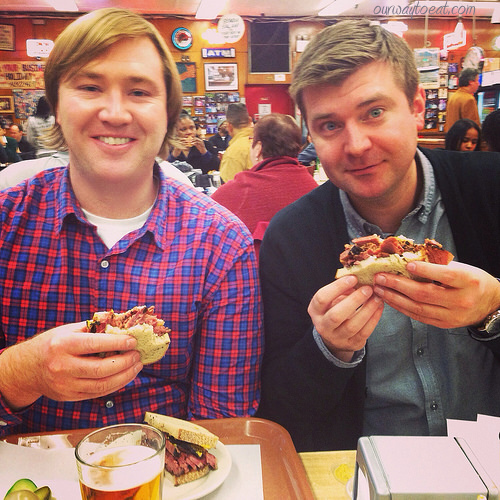 Katz’s Delicatessen gets hype, but lives up to it. 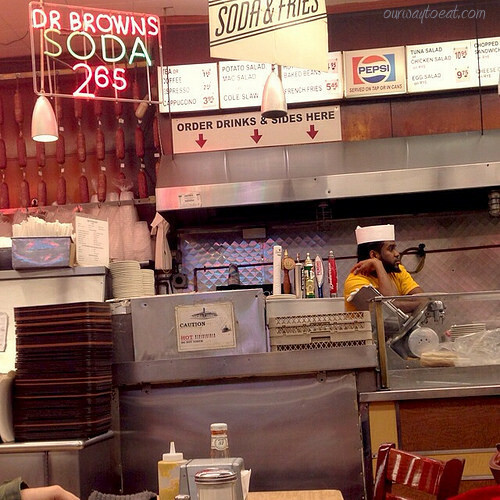 The food is timeless deli fare, and the atmosphere in itself makes it worth the trip to the Lower East Side. 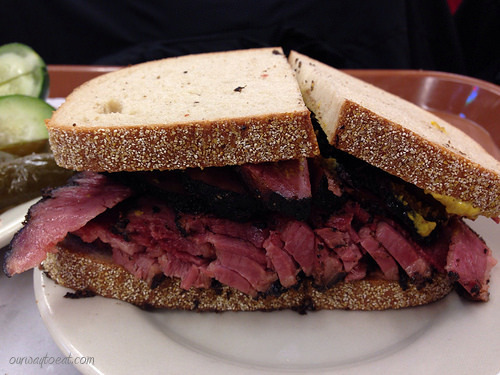 If you get a chance to go to Katz’s Delicatessen, you should order the Pastrami on Rye with Mustard. Say “yes” to the pickles and don’t lose your ticket. This is a meal experience in New York not to miss.